Today in more Kim Kardashian news: The reality TV star was spotted carrying an Hermes tote designed by baby North herself! Kim rocked an all-white dress and a grey long coat while hanging out with husband Kanye West. Her best accessory, however, was a beautiful Hermes bag that her daughter hand-painted for her. 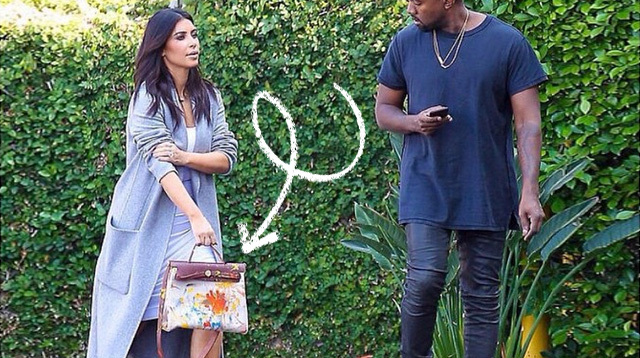 If you look closely at the bag, you'll even see North's cute little orange handprint! Kim's cool new accessory was reportedly a gift from Kanye, after she celebrated her 34th birthday on October 21. "Kanye had a box [with an Hermes purse in it] and I opened it up and it was all painted really cool and on my computer was this message that said 'Play' and it was a video of my daughter sitting outside painting the purse. I had thought it was this new artist who had painted this purse [but] it was my daughter. It was amazing," she told Us Weekly. An Hermes bag isn't cheap, because it can sell from anywhere between $8,000 to $150,000! This kind of reminds us of Angelina Jolie's wedding gown, which was decorated with her kids' drawings. What do you think of Kim's new tote? LOVE IT or LEAVE IT?